Mindexcoin has been gaining a great deal of space in the cryptocurrencies market. However, the work continues. In order for MIC to gain even more volume in the coming days, the company’s internal exchange will no longer operate. MIC users must withdraw their token and deposit it into their ETH network wallet. This small action of all the investors of Mindexcoin will represent a great appreciation of the currency, due to the importance of the network Ethereum. 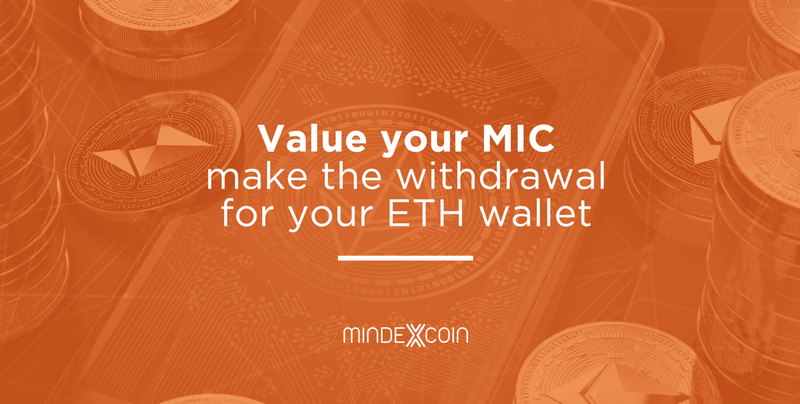 If you have purchased your MIC directly in the internal exchange, your tokens are certainly stored in Mindexcoin’s own BackOffice. Therefore, request the withdrawal and then deposit your assets into an ETH wallet. Ethereum is a platform that had its final proposal submitted in 2013 by Vitalik Buterin and was officially launched in 2015. The Ethereum project started with a crowdfunding process, ie, online funding, which took place between July and August 2014. The Ethereum project has impacted the technology market in several ways, and has become one of the most important for the development of new cryptocurrencies. The Ethereum platform is capable of executing intelligent contracts and decentralized applications using blockchain technology. That is, this makes these applications totally safe from censorship, fraud or scams. Today, ETH, cryptocurrency of the Ethereum network, is the second most famous in the world. Mindexcoin being with it, as a partner, brings confidentiality and appreciation. That’s why it’s so important for MIC to gain volume with ETH. We wish you to be part of the success of Mindexcoin, so let’s work together. Value your MICs and transfer them to your ETH wallet.